Rather than do individual posts about these old favourites I thought I would just report back on them and tell you all is well-they are still delivering the goods! HI has a new favourite dish-a kidney and suet pudding that features on their downstairs menu. It doesn't appeal to me but it makes his little face light up. My old staple the burger is still as glorious as ever, only now due to ever shrinking stomach size I can only eat half. To think of the days that I used to be able to eat a starter and a whole burger.. This was particularly good. We went on a hot saturday evening around six o'clock and the food came out really quick and was super fresh. The usual order of malaysian pancake, choi sum with garlic, salt and pepper prawns, Sichuan chicken and noodles really hit the spot. The left overs of which there were many went down a treat the next day. 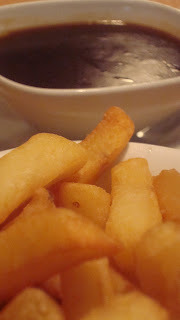 For more straight forward Chinese we go to Chow and this is where we indulge in our guilty secret pleasure which is chips and gravy, which to taste right has to be had in a Chinese restaurant. It takes me back to my childhood when my best friend and I ate this in a place called Mauchline. The salt and pepper squid is very good. and the Sichuan chicken although tasty is a very different beast to the one at Asia Style. What can I say? Still very tasty, still very reasonable. I have no photos as we always tuck in before I remember to take them! Rachel always orders the same-butter chicken, chicken on the bone, chilli prawns, garlic potatoes and a peshwari nan. Yep, that's all just for her. HI and I always order the same-butter chicken, lamb mince with peas, tomato and okra and lamb saag. And the magical £15 rule still works! We headed here after the wedding, hoping that it would be open, and we were in luck, for there are not to be many places open in Shoreditch before five. I liked the vibe of the place, it was very Born- Barcelona. 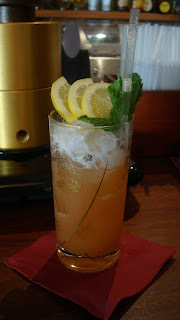 We shared some Padron with the obligatory hot few, I had two very tasty handmade lemonades. 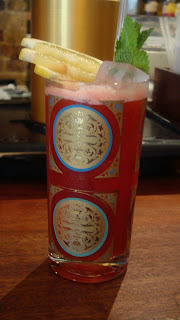 a cocktail which is not often found in cocktail bars. I would definitely come back to Pinchito Tapas to sample the food as it's a lot closer than Barcelona. The Clerkenwell Green:restoring faith in gastropubs. My sister choose to have her wedding reception at the Clerkenwell Green and it turned out to be a pretty good choice. Slightly wary from our bad experience at the Clissold Arms that night before we were pleasantly surprised. We started off with a variety of canapes including smoked salmon, mushroom rolls, foie gras, little lamb meatballs and some other bits and pieces. 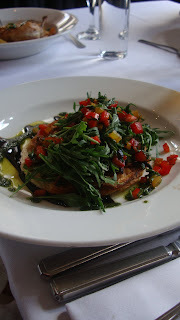 For our starters the winner, once again, seemed to be the veggie option of goats cheese with aubergine and pesto. The look on my mum's face was priceless-a clear case of order envy if ever I saw one. My smoked mackerel pate was good as was the parma ham with figs, which for once were sweet. The mains were very good, my chicken with chorizo was excellent and I ate it all. as was the blue cheese and onion tart. If I was in the vicinity again I would definitely come back here for something to ate. Proof that not all gastro-pubs are created equal! Given that the curious-eater’s currently with child and not doing too much in the way of eating out, she approached me and asked if I wouldn’t mind doing a few guest blogs just to keep things ticking over. So by way of introduction, my name is Will. 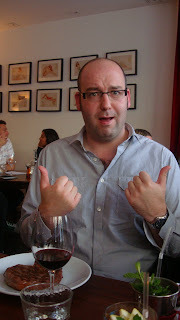 Last week was my birthday and as a birthday treat, some friends and I headed to La Trompette in Chiswick. 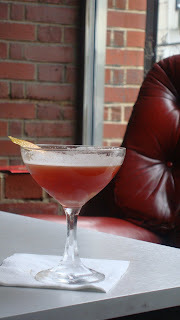 However, this particular post is not about that meal but it’s relevance will be revealed. All I want to say is if you haven’t been, I would thoroughly advise that you go as soon as you can. 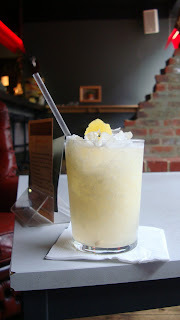 Have a look back through the curious-eater’s previous posts, the food is absolutely amazing and a more splendid dining experience you’ll struggle to find. Upon settling the bill we were presented with some vouchers to visit The Glasshouse Restaurant in Kew which is a sister restaurant of La Trompette, in Chiswick and Chez Bruce in Wandsworth. Given that it was a very reasonable £18.75 for three courses at dinner, myself and my delightful girlfriend Nina felt that it was too good an opportunity to miss. 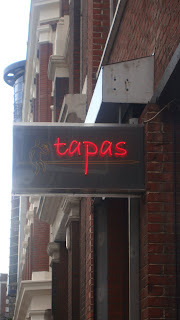 We booked to visit the following Monday evening and I have to say we were not in anyway disappointed. which I rather cheekily managed steal a mouthful or two of, obviously in the interests of research and not out of greed! Ahem! I have to say I actually preferred this to the starter I had which was the ‘thinly sliced veal with blushed tomatoes and watercress’. For our mains Nina ordered the ‘Duck leg confit with spring savoy cabbage, beetroot, carrot puree and sauce poivrade’. I ordered the ‘John Dory and crispy squid with fennel, aubergine, and tomato salad’. Both dished were flawless. I wont even try to describe how good both dishes were. I think the photo’s speak for themselves. For our pudding I had the cheese board and Nina ordered the ‘strawberry sorbet with strawberries and crushed meringue’ which when boiled down was essentially a lovely Eton mess. For the wine we selected, with the help of the sommelier, a Chenin Blanc (Old vines, Stellenbosch) which was wonderfully dry with a real citrus aroma which was very reasonably priced at £25. All in all, a meal of superb quality. If pushed though I’d probably have to choose La Trompette as being the better of the two restaurants. Although, I’m assured by Nina that Chez Bruce is the best of the three. I may need to start inventing special occasions just to have a reason for visit Chez Bruce! I can't beat about the bush. This place was bad. Not only was it bad but it was expensive too, a combination of my two least favourite things. The reason we were there was a family gathering, we had originally planned to go to Cay Tre for some Vietnamese but my sister was getting married the next day and the opportunity arose to meet the groom's familly, so when duty calls.. The place is pretty generic looking: with long wooden tables, ornate lighting and muted colours. We were waiting for people to join us so we started off with some bread and olives both of which were unremarkable. What was noticeable is that we were not given any side plates and so had to drip olive oil everywhere whilst eating our bread. There other thing that should cause concern was that the menu was distinctly uninspiring. 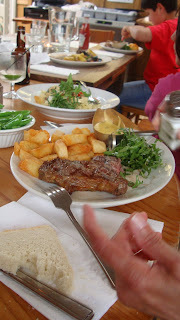 There was not really anything that any of us wanted to eat from either the starters and mains, which is unusual. The mains were again underwhelming, I had the pork loin with chorizo and spinach which turned out to be a huge chunk of tasteless meat, there had been little preparation put into the meat and the tomato confit was bland. The steaks were also declared tasteless and chewy, even though asked for medium-rare. the winner turned out to be the veggie tagliatelle with feta, tomatoes and walnuts. For three people two starters, three mains, two beers, two ginger beers and a juice it came to £100 which to my mind was ridiculous. As you know, I don't mind spending money on food but it has to at least be tasty. 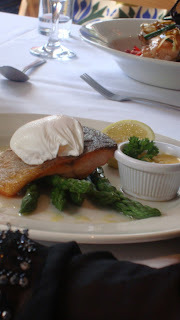 There seems to be a huge variation in quality where gastropubs are concerned and in an area like East Finchley where there is not much competition, a place like the Clissold Arms will flourish, which is a shame as they could do with pulling their socks up. I don't think I am being harsh as we had a good example of what is possible from the Clerkenwell Green the very next day. I If anything they had the tougher deal, they were catering for 60 at a wedding, a 3 course sit down and the food was very good. 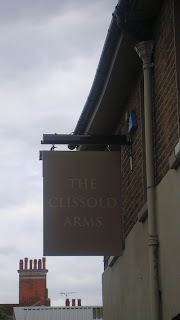 Anyway I would not go back to the Clissold Arms and in fact would probably ask to go elsewhere..
from a recent weekend in the big smoke, followed by the first of what I hope to be many, guest blogs..